The long awaited release of the NOAH Movie starring Russell Crowe will commence in theaters on Friday, March 28th. Anticipating much involvement from the Christian community both in favor of and against the movie, I accepted the opportunity to screen the movie just a couple days ago. In addition to screening the movie on my press junket to Los Angeles I had a great chance to speak personally with Director Darren Aronofsky and Co-Writer/Executive Producer Ari Handel at a press roundtable. I was impressed by their candor and respect for our questions. This article shares my thoughts and recommendations regarding the movie as well as highlights from the interview. In the Bible we are told that Noah found grace in the sight of God (Genesis 6:8) and so God trusted him to tell a wicked and corrupt world of the importance of their need to agree that the Lord’s way was best and that man without the Lord was destined for hopeless death and destruction. When you read Genesis chapters 5 through 11 you can learn that Noah must have preached somewhere between 55 and 120 years before the great flood. Noah had a wife and 3 sons, Shem, Ham and Japheth and the Bible tells us that the five of them along with the three wives of Noah’s sons entered the ark before the rain and waited there for 7 days before it began. Noah was not able to convince anyone else to join them so it was only those 8 people on the ark (Genesis 7:13, 22-23). Then it rained for 40 days and the waters flooded the earth for 150 days … that is about 6 months! (Genesis 7:12, 17) Noah sent birds out to see if it was safe to leave the ark. Several birds went out and returned with no sign of safety. Finally a dove returned with an olive leaf which told Noah that hope of land was realized and God’s promise of safety for he and his family was true. 7 days later he sent out another bird, which did not return to the ark. It was then that the family and all of the animals exited the ark and immediately built and altar to the Lord (Genesis 8:20). The first bow (rainbow) was set in the sky as an everlasting covenant that God would never again destroy the earth by flood (Genesis 9:11-17). Mostly true to the Bible this full-scale visual epic takes the audience on a journey through some Old Testament history. No doubt the aim of the film is to provide a spectacular experience for the movie goer that retells the miraculous story of the world-wide flood that destroyed all but 8 people and many animals. It uses history that is found in the Book of Genesis in the Bible as well as other non-biblical sources such as The Dead Sea Scrolls, the Book of Enoch and the Book of Jubilees. Producers of the movie also consulted modern theological and historical sources to bring this story to the big screen. The movie begins with some history that happened before Noah’s day, including a quick recap of the first murder (Cain killed his brother Abel) leaving the descendants of Cain to pursue continually evil ways. Conversely, Noah is of the lineage of Seth, a brother that was born after Abel’s death. Seth’s descendants continue in the ways of the Lord. 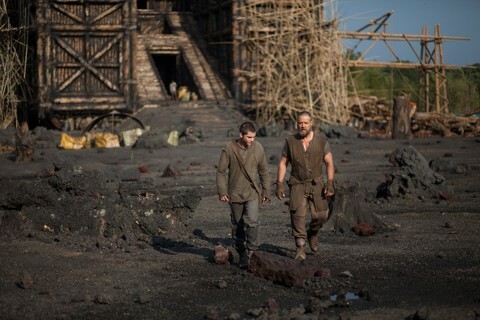 Pictured above Noah (right, Russell Crowe) and son Ham (Logan Lerman) with construction of the Ark behind. The movie goes far beyond the story that many of us learned when we were children. It is not all about the animals who went two by two. Instead it is about Noah, the man, and his family. Director Aronofsky uses words like “mythical”, “metaphoric” and “poetic event” to describe this work that he has dreamed about since he was as young as 13 years old. While he knew this would be a fantastical story to tell and an extremely ambitious undertaking, he also spent much time contemplating Noah and his family – what they must have gone through during this the end of the world as they knew it. May Christians have spoken out against this movie because it contains some elements that may not be found in the Bible. I encourage believers and nonbelievers to read the account in the Bible before you go see the movie. This will introduce you to or reacquaint you with the true historic account of Noah and the flood and allow you to form your first hand opinion on this movie. Since I do not want to spoil the movie for you, I have taken some of the elements and listed them below along with where you can find it in the Bible. Compare what you read with what you see onscreen. You will be so glad you read the book first! The description – Genesis 6:13-16. The purpose – Genesis 6:17. This movie is rated PG-13 and truly parents should watch the movie before showing it to young children. There are some scenes of extreme violence, including a gruesome battle. As I mentioned earlier the movie is much more than the children’s story of Noah and the Ark. I believe this movie will go on to be one of the best Bible stories presented on the big screen in almost fifty years. The movie was great and it caused me to dig a little deeper for answers in the Bible. I pray it will do the same for you. What Will You Do About This Movie? Some Christians will go see the movie with a very critical eye, others will go for the entertainment. Some won’t go at all. Clearly the Director and the Executive Producer admit that while they attempted to stay true to the words in Genesis and to “not contradict anything in the words of Genesis” they did purposefully “dramatize and humanize themes that were being put forward in the words of Genesis”. They indeed “violated expectations” for the viewer. This is why I want to encourage you to study the Biblical account of Noah and the flood and then go see the movie. Then when someone asks you about it you will be prepared to answer from a Biblical world-view rather than from a second or third opinion of what someone else says. The movie NOAH talked much about justice and mercy but it did not talk about the grace of God. In fact, it never mentions the word “God” even once. The true Biblical story of Noah is of great significance to Christendom in that it points directly to the truth of salvation. Just as Noah believed God and did exactly what God told him to do, he was saved by grace through faith. Grace was given to Noah and his family and they accepted God’s grace. Noah preached and tried to convince others to believe God and they chose not to accept God’s grace — they perished in the flood. When we put our trust in the finished work of Jesus on the cross we too are saved by grace through faith. Nothing we can do will merit our salvation from the penalty of death that we owe for our sinful actions (Ephesians 2:8-9). The only salvation we have is to believe in what Jesus did for us. Just as Noah chose to get on that ark to be saved (by God’s grace), we must choose to believe in what Jesus did personally for us to be saved from certain death which is the price we must pay for sin. Jesus died in my place. He paid my sin debt. He died in your place. He paid your sin debt. Do you believe this? Related reading: How Did Noah Fit all those Animals in the Ark? Thank you Pamela. I have hopes that this movie will spark discussion about Noah, the Bible, God, etc. We should prepare ourselves to give an answer. God bless you. Thank you for the encouraging words Robert. I hope you go see the movie, we need Bible thinking Christians to give first hand opinion and share the truth. I hope you enjoy the movie David. It will cause you to think hard. Hello Pamela, it is quite OK< I know what I believe. As the flood is in God`s Word, then it is true, it happened. Just hoping some of my non-believing friends see it too. Kris…that link is awesome. That is the best method of evangelism there is and what I use in the streets….and many reject it to my face too but it is worth it. Please, everyone, check out this link above for Noahthemovie.com for a great way to share the gospel of Jesus Christ. Thanks for this Kris as well as your other comments. Yeah, I likes the 180 movie and all, but Ray Comfort lost me there when he said that if you’re a Christian, you shouldn’t do _________. Listen, I believe in the Bible and it’s teachings. What I don’t believe in is judging others. If I want to go see Noah, I don’t appreciate being told that I am “living a sinful life” etc. etc. If I need to be convicted of a sin, I trust that God will reveal that to me, as long as I stay in the Word, and true to what I believe He has asked of me. “They will know we are Christians by our opposition of popular culture…”? Sorry I meant liked* … should’ve read that before I posted it! So God is not mentioned even one time in the movie and yet the biblical story is completely about God and the total obedience and faithfulness of His servant Noah; and I am supposed to go and spend God’s money to watch a bastardized worldly version that is strictly for entertainment??? I understand Noah had a stowaway on board that he killed? Again, I don’t see your logic. That is like recommending everyone go to Disney Word and take the little kiddies; when the CEO is a full blown homosexual and Disney is advancing the homosexual agenda. What kind of recommendation is this? Are we to spend God’s money so the Bible can be corrupted? Get serious. The inmates I counsel in prison get it. Why can’t you? 1) Do you buy anything that is made in China, Vietnam, or Laos? Look at your shirt labels. You are supporting Godless Communism if you do. Try buying tennis shoes not made in China. How about Christmas lights for the tree…where do those come from? If you do, you are paying for abortions with your own dollars. If you don’t, you are not rendering to Caesar and might end up on the other side of those bars. 3) Do you have cable TV? Do you have cable internet? Do you have a mobile phone? Do have a land-line phone? Do you subscribe to the local Newspaper? Do you buy gas at a pumping station that pays a gas tax to your state? What do you think the taxes you pay on those products support? 4) Do you shop(buy) at Amazon, Home Depot, Target, Barnes Noble, Apple, Starbucks, EBAY, NIKE, GAP, buy Ben and Jerrys products , Oreos, Levi Strauss jeans, Banana Republic, AT&T, Microsoft, Jet Blue, Johnson and Johnson products(there are many), Marriott, Expedia, Orbitz, Citi, or use MasterCard or belong to AARP? If you do, you have just supported those, who support with your dollars, the gay marriage agenda. I could go on and on but Pastor Jack will get his editing pen out soon. Yes, I try to avoid buying at those places I have listed as much as possible, and yes, I wish Home Depot would just SHUT UP about whether they were for gay marriage or not, as it is one of my favorite “go to” fix it stores. Disney…I here you, and we have contacted Disney to lodge our complaints in the past, but I hold no ill will against Christians taking their kids there, at least once, to experience Mickey Mouse. These producers of Noah, are presenting a Biblical event(Flood), with the names of the real Biblical people(Noah and sons) in a format that will bring discussion among those who might otherwise blow it off as a crazy myth if the movie had not been made. This is a Bible epic. How often do the heathen get a chance to view an actual historical Biblical epic event but also have a chance to see the worldly heathen producers present a feasible cataclysmic worldview paradigm that(even though unintentional) answers Godless evolutionary uniformatarianism? I am looking forward to the movie Pastor Dale, and actually enjoying myself! I might even buy a bag of popcorn. Pastor Dale, I see so much good in what DocReits has said. Can we not go anywhere in this world without having a pagan or ungodly influence? Even a wedding ring, with marriage vows made before God, is a pagan symbol of fertility but to judge others so harshly who see this movie. It may cause to stir them to action in seeing their need for the Savior. The author of this fine article was very honest in its shortcomings and I think she did a good job of this interview/review and let people know what to expect. God is not mentioned in the Book of Ruth either but we see the Redeemer in Boaz’ life and Ruth as the Bride of Christ. Then you wrote, ” That is like recommending everyone go to Disney Word and take the little kiddies; when the CEO is a full blown homosexual and Disney is advancing the homosexual agenda.” really! You compare this to recommending someone to go and see a full blown homosexual movie and advancing the homosexual agenda! Wow! That’s pretty harsh and an unfair comparison and unfair comparison. I hope you have more grace for your prisoner’s in your ministry than you do for those who have gave a fair assessment of a movie who upfront told us all what to fairly expect and no hidden homosexual agenda’s. That is not playing by the rules fairly Dale. He who is without sin, cast the first stone…perhaps it should be aimed at ourselves first. Thank you Jack, I think you and I were posting our comment at the same time. Good points Doc … WOW! I never quite thought of all those things. Thanks for your informative comment and for making us think about it. Hello Pastor Crowe, I appreciate the fact that you feel as though you need to speak out against this movie… and Disney as well. I do not appreciate that you are speaking as someone who has not even seen the movie. Are we to hate everything and everyone when they are simply unsaved people doing things and acting as unsaved? And are we to hate Disney because their CEO is caught up in sin? This movie does not corrupt the Bible. And to believe that it does gives the movie and Hollywood more power than God’s own word. His word remains true even when people misinterpret it and sensationalize it on the big screen. So, you see I do not have to “get it” because what you are proposing is not correct. We must be always careful to speakmthe truth in love. I am serious and my recommendation remains. Study to shew thyself approved and then go see the movie so when you speak about it you are speaking from first hand experience and not from something someone else wrote or said. Pastor Dale….I had posted Ray Comforts movie link for his production that is concerned with the biblical Noah…. ….I would not spend money on the one with Russel Crowe in theaters either….don’t need to support a movie that is produced by a man who is an overt athiest . Hollywood gets too much cash now for the filth they produce. I do believe in being informed but do not have to spend money on such things when there are plenty of reasons to go by the Bible and heed the info leaked about the film. By the way ….I DO believe in getting first hand knowledge but I just don’t spend money to get it if possible….in the case of movies I try to wait until they come out on TV …One does what one can to support and endorse what is biblically sound ….to comment without knowledge is not wise, agreed. Your point is well intended ….I am presuming I suppose but I think also that others make the same offering to the best of their ability to do as the scriptures they have understood thus far in making their decisions about such things. In the meantime it seems wise to follow the scriptures in exhortations…. Gal 6:1 ¶ Brethren, if a man be overtaken in a fault, ye which are spiritual, restore such an one in the spirit of meekness; considering thyself, lest thou also be tempted. We do indeed live IN the world but are not OF IT ….AND our righteousness is not of our own or of the flesh but from the Lord and by grace is it not? You seem to be a man who has knowledge of the scriptures …how do you read Romans 14? Would you share with us what you find there? To all who have posted esp DocReits, I might not agree with you all scriptually, however, at the moment I am reading the epistle of James. And yesterday was looking at James ch 4 vs`s 7 to 17. And it struck me esp vs 17 “so any person who knows what is right to do but does not do it, to him it is sin“. I think, before going to see this film, we should examine ourselves and see if God is leading. We are all individuals, agreed? And God treats us as such, agreed? Then let us be lead by our own conscious, agreed? The Holy Spirit will convict us, agreed? Not man, agreed? To one it might be sin, to another it might not to see this film. Personally I will go to see it, because I am strong enough in my faith, but also I will not cause a weaker brother or sister to stumble. Agreed! Thank you David. Again, that is why I encourage study. Certainly, IMO, it does not apply at all in the case of the person I addressed with my comments. I was attempting to show him all of the things he already might participate in, which are extra Biblical, which support un-Godly causes. The irony and hypocrisy, which apparently was missed, is that here we have a dramatization, like the Ten Commandments(which also took license from the Biblical text), which portrays an actual historical event recorded in the Bible of monumental importance. To a lesser degree is the irony that your admonition, to read Rom 14, would be directed toward me and not the other poster. It is important Kris, IMO, to know that we, as Christians, do not have to lie down, when loud voices would dissuade us from doing those things which we believe are OK. They are not going to lose their faith by us seeing the movie..quite the contrary…they are condemning us for seeing the movie. “It is good not to eat meat or drink wine or do anything that causes your brother to stumble”. Do you really believe you will make any Christians lose their faith by seeing this movie, Kris? No, I didn’t think so either. The take home Kris is that, I believe, we as Christians do not have to be bullied by those claiming, “Thus says the Lord”. This has nothing to do with offending the weaker brethren. I appreciate your words here . I guess perhaps as I recall the great impact that the movie’ The Ten Commandments’ had upon my walk of faith after I came to Christ through searching our and ‘revisting’ the Bible which I assumed I knew ‘enough’ about in 1968 I am remembering how that movie effected my earliest efforts to walk according to the things I read in the Bible. Not knowing much more than what I read as I was consuming the Bible with relish and desiring to follow what I read….I did not realize the way my generations lack of knowledge of Biblical truth and the mixtures of other ‘spiritual’ “disciplines’ would effect my perception of what GOD had recorded by holy men of GOD as they were moved by the Holy Spirit. In my earliest understanding which was full of misconceptions and misinformation and ignorance….which I am STILL ardently studying to overcome….I was wide open for deceptive ideas and things people who came across my path brought into question. I had spent considerable time in the various ‘flavors’ of spirtuality in the 60’s and that carried a lot of weight in my mind when thinking if I ‘got’ all that GOD intended for me to receive along with my intention to follow Christ after my confession of faith and pursuit of Him in the study of the Word. Since that time I asked the Lord to teach me ‘what happened to the church’ and it has been instructive indeed. I feel I am always catching up to what He wanted me to know and learn from childhood but even those who did follow after the faith were often derailed by ‘isims’ ….of one ‘flavor ‘ or another. In short the movie ‘The Ten Commandments’ lead me to think I should experience God presenting Himself in some kind of ‘burning bush’ or audible voice ! What hubris one might think NOW but then the culture was filled with such ideas of personal experience from many of the occult and eastern religious influences abounding. It is true that we do not know what we do not know and what we do not know CAN and most likely will hurt us eventually. My knowing I did not know and was not what I considered to be anything more than zealous for the Lord I was very open to be taught and led and I had no idea how to identify who was worthy of my trust. I read that we were to test the spirits but really did not see how to do that …anyone could , after all , say Jesus came in the flesh ….since that time I believe I have a better understanding of this . During that time the girl that brought me to ‘revisit’ what I thought I knew about the Bible and Jesus was someone I knew in high school …but not too well. Keep in mind Humanism teaches all people are good and that was pretty much what I thought…like many. Though a new believer and reading the Bible day and night I still wanted to learn more and learn as much as I could. This left me open to allowing anyone who claimed the knowledge of the Word and God and Jesus to speak into my life. Through this idea of thinking that I might be ‘missing ‘ what God wanted me to have, know or experience I began a lengthy time of being deceived , trusting anyone who seemed to demonstrate faith in Jesus and many came actually ‘proving ‘ this through their demonstrations …of lying signs and wonders…impressive to the zealous, hungry but unlearned. Thiinking I might hope in hearing from God audibly both intrigued me and frightened me . I often told the Lord how I felt and then left it at perhaps He knew if he spoke audibly to me I might keel over! I had been contented and thrilled with the reading of the Word and how it ‘spoke ‘ to me and did not realize that indeed was all I needed . I remember the guy who came across my path whose question of my being ‘really saved’ which according to his ideas was not ‘sure’ until I went through the ‘baptism’ of the holy spirit. Such questions cross the paths of people who do not realize the way God ‘speaks’ and the movie I so enjoyed and found inspiring years prior to my conversion also made an impression that perhaps this guy’s questions were valid. I had NOT experienced a ‘voice’ or ‘feelings’ but I was sure that the Lord had answered my prayer to save me and teach me . My point is that those who are surrounded by spiritual ‘things’ and now believe all ways to GOD are valid….etc as we have found through our walk today …are vulnerable to thinking that they KNOW God already and every and any idea that is ‘spiritual’ is valid and true. I do not think anyone who belongs to the Lord and follows after Him, studying the Word as we are told to do will ‘lose’ their faith in Him but I do think that the ignorance of the scriptures as GOd has said ‘ MY people are destroyed for lack of knowledge’ of what HE has inspired is a possiblity. As I watch people like Ray Comfort and speak with people myself I see that one of the stumbling blocks that we encounter in this walk is that people THINK they KNOW what the Bible says and have little appetite for it. I am thankful for your zeal and desire to keep on becoming informed as to the things people are being exposed to and then giving an answer from scripture. Those who are hungering and thristing for righteousness and are meek to realize their poverty of spirit are going to continue to seek Him and that is a good thing…for then they shall be filled. I would hope that people would be ‘smarter’ than I was and maybe able to study all that they hear regarding hearsay and teachings …For me …I found I was willing to study to examine all things but I am still doing so after 46 years of going after truth. So many things I did not know …I see it is a life long effort to find answers to many of the things people assume today are biblical. How I underestimated the deceptive ways of our adversary ….he has not changed his tactics but the subtlty has worked among those who have been raised to believe all people are good and everyone has a worthy point of view regarding God…..Humanism crept in where the scriptures and biblical christianity was supplanted…lots of damage done while even those who cared to learn truth pursued it…and it goes on today as well we know. It is what we THINK we know that renders many to disregard knowledge of the Word of GOD. Kris you said it all in that last sentence. If we are not daily in the word we will be daily IN the world. I just need to share that I saw The Ten Commandments on the big screen when I was a child and I did not know the Lord then. That was an amazing and spectacular movie about things that we can read about in the Bible. There are things in that movie that are not true to the word. Then when I was older and in a relationship with the Lord I saw it again. And you know what? It is still an amazing and spectacular movie! What I mean to say is that NOAH will go on to be an even bigger movie than The Ten Commandments. The best thing we can do as Christians is to share the real history from the Bible and point others to Jesus. This movie opens doors and we should walk through! Thanks for sharing your heart dear. The church pew is one of the most spiritually dangerous places as many seated there think they are saved, and are not. They are lulled to sleep in the “lostness” of doing the unnecessary. I have a whole library of Ray Comfort’s materials. He, like the folks who sponsor this site, “get it”, which provides a beacon of light for those who “happen” by. Having said that, I am concerned about some things you have said in the past and restate today. I traveled the same time-frame in our culture as you. From the “Jesus Freak” movement of the early 70’s(when I was saved), through the Charismatic renewal of the late 70’s, early 80’s, through the Shepherding movement of the early 21st Century. I hope I am not misunderstood as I say this(not a chance, …;-)), but the Lord’s primary objective, IMO, is not that we be filled with the knowledge of His Word. Heretical, right? I know that is a constant clarion call, in your writings Kris. His primary objective is also not that we have fellowship with one another(If you are reading this Geno…that was for you…;-)) Those things are “VERY” important, but not of primary importance, nor necessary for salvation. I would encourage you to stop fretting like Martha about these “many things”, such as humanism, spiritualism, lack of knowledge of the Bible, and rest in the knowledge that you are saved when you acknowledge your need for God, repent of your sin, and believe in God’s Ransom for your soul, Jesus. Here is where I will lose some. Not only does salvation allow for cessation from good works, but it also means that we do not “need” to read the Bible. There is no “need” to go to church. No more “need” to have Bible studies. No more “need” to have fellowship. No “need” to take the sacraments(Baptism and Holy Communion). These are not of primary importance and avail us absolutely nothing “IF” we missed what is “needed”. Once we take care of the primary then the secondary naturally flows as a consequence of taking care of the needed. Again, these secondary items are not “need” based, but performed as water flowing from the River of the Occupier of our soul. “Martha, Martha, you are anxious and troubled about many things, but one thing is necessary”(Luke 10:41,42). I think anyone who loves the Lord is going to run into interference and opposition as Jesus told us …but as I regard the past things of this kind …I am now equipped with some knowledge of the tactics and errors we have encountered. As I recall the Word of God has been the focal point of the adversary since the Garden of Eden. Media developments have only sophisticated the means by which people presume to get knowledge and more and more are moved to doubt the Bible. For believers it opened a conversation and study for giving an answer to the various heresies that some gulped up like candy…..for unbelievers the arrogant assertions continued to shore up their various areas of doubt about the truth of the Bible. In short some those who walked with Jesus and observed His perfect life , death and resurrection and ascention still chose to deny Him. Any excuse to reject the Bible as God Breathed is sought and accepted by those who want to be their own god or make one that feeds their desires . Thus …we do have, once again , opportunity while the door to speak remains open , for whatever time allowance there is …to speak what we have seen and heard from the testimony of the Spirit of GOD through His holy word. How gracious He is to us all. Thanks for your kind and caring reply Doc. Indeed I would agree that there are many “doings’ that go on and that it also seems that many times people go TO church , sit in a pew and go home thinking that is the end all be all. Or they ‘serve’ and get busy with busy work …rather than those things that GOD has pointed out to us that are important . Being in relationship which is our salvation relation with the Lord is of course our greatest need. Without being born of the spirit of God through faith it is impossible to be ALIVE in Christ . I think it interesting your siting that point about Martha….cumbered with many things but as I rechecked the section of scripture didn’t Jesus commend Mary for her attention to THE WORD which He was teaching ? Correct me if I am wrong but it seems that the WORD IS the focal point as Jesus IS the Word and is revealed through His Word and it is the incorruptible seed which comes by hearing and hearing by the word of GOD. I believe that one may grow not by all of the various ways that we have available to serve one another and fellowship, unless we have the first thing first….being born again of incorruptible seed through faith indeed. Many times I think that when we may hear a teaching from the pulpit or from reading or anyone sharing it is for our being stimulated to go and search out the things that the Lord may bring to mind. Our interest in study of the Word is to be instructed…reproved and corrected that we may be complete , throughly furnished unto all good works. So much of our strength and encouragment comes from our time with the Lord in study of His Word. I cannot imagine why anyone who loves the Lord would not see the value and importance of daily time with the Lord in His Word. I give you props for being much smarter than that Kris. I think you understand my meaning quite well, but in the off chance I am mistaken, let me give you a corollary to the same truth. I am a Doctor and I have seen a few folks over the years who are very “religious” and devoted to zealous acts in performing their perceived devotions to God. One of those acts is fasting. I remember one such individual who made a “pledge” before the church that he would fast 40 days and nights, as Jesus had. This did not end well as he believed he was being unfaithful to God, by stopping, after becoming disoriented and fainting after the first three weeks, into the fast. He ended up in ER, but did survive. How young and unlearned believers follow after various foolish challenges is not God’s fault but even more reason to study to show ourselves approved unto God a workman that needeth not to be ashamed rightly dividing the word of truth …our enemy knows the Word and he knows the various areas of vulnerability of those who neglect the command to put on the whole armour of God . Each ‘piece’ of that armour refers to the Word of GOD which is for us to “put on” as it is the bread which came down from heaven and is ours provided daily to give strength and wisdom that we might walk IN the spirit and not according to the flesh. We are to ‘fast ‘ from the works of the flesh by walking in the spirit ,…. Jhn 6:63 It is the spirit that quickeneth; the flesh profiteth nothing: the WORDS that I speak unto you, they ARE spirit, and they ARE life. I am in a vicious feedback loop, as your wheels appear, to me, to be stuck in the mud. Yes, we should read the Word daily. I never said we shouldn’t. As far as the rest of what I wrote…never mind, as …you haven’t. A panel from men from Answers in Genesis discusss their views of the movie after seeing it….fyi and consideration. I believe Russell Crowd’s comments of cruelty and evilness were made about God, not Noah. I appreciate you taking the time to write the review. I disagree with it but that is fine, too. I am curious how you can recommend something that will have a tendency to fill a person’s mind of untruths concerning the Word of God? Is not the written Word of God the ultimate source of how God feels about all situations? If not, then Jesus was incorrect to quote the written Word of God to Satan. Then, who are we to speak any differently? We are not give any areas of our lives, once a Child of God thru Jesus Christ’s blood, room for God’s Word to be distorted to us. Why distort God’s Word in any way, shape, and form? Why participate in anything that does just that? I don’t recall anywhere in the Gospels where Jesus spoke anything but the truth of God’s Word. Not, hearsay or misrepresentation nor participate in someone who does. The Word of God doesn’t say, “Guard your heart, ” just for fun of it. Did you ask the director if he would allow you to pray with him and ask Jesus to become the complete Lord of his life? Do you think any of the early disciples such as Peter, John, or Stephen would have point blank told this director to repent and surrender his life to Jesus Christ who loves him before leaving his presence? I think so. What hurts even more is to see this online Christian publication not only endorsing this movie that is not of God but selling tickets on an affiliate basis. When they remove their endorsement, I will pray and ask the Holy Spirit to guide me towards this publication. I have, currently, unsubscribed from their newsletter as of today. Are you so weak in the faith(if you are, please forgive me), that you cannot bear to hear God’s Word miserably butchered. If you answer yes, then you have never taught Sunday School. Nor have you heard me, in my earlier days especially, attempting to street witness to unbelievers. I think I had Jonah on the Ark and Noah spending three nights in the belly of a whale…let alone quoting Scripture in the right Book or by the correct author. It was a mess and very sad, but my heart was in the right place. So you are suggesting that by the producers placing Tubal-Cain on the Ark, that it will be worse, than me placing Jonah as the Ark’s captain? What is wrong with that picture? Second, you make the rhetorical statement, “I don’t recall anywhere in the Gospels where Jesus spoke anything but the truth of God’s Word. Not, hearsay or misrepresentation nor participate in someone who does”. “Not participate with someone who does”! Serious? Have you not read about Jesus being the “friend of sinners”? He dined with the worst of them..from Matthew and his tax collecting buddies, to Simon and don’t forget the harlot washing His feet with her tears, to the Pharisees who not only “misrepresented” the Scriptures but blasphemed the very Holy Spirit, resident within Jesus. Do you not know that He was in Synagogue with these very “misrepresenters” (your word) of the Truth? He participated in Sabbath with these people. Jesus also “participated” all of those years at Passover and Sabbath when the money changers were selling their goods whom He later expunged from the temple. Think about all of the times he tolerated them. He wasn’t such a hand-washer as you make Him out to be. He got right down with the sinners, not participating in their sin, but rubbing shoulders with them, participating in their lives as they got it wrong, as they sinned. He was among us. He didn’t care if they misquoted Scripture, He was concerned about their hearts. Why can’t the legalistic get that?? This is where you and your fellow travelers get it wrong, and this is my main point: Do you really think that I am going to be participating in this supposed sin of misrepresentation by the producers of Noah by paying for my ticket and watching the movie? Or do you see my participation of watching the movie as separate from participating in their sin? I am not misrepresenting Scripture as I sit in the seat in the theater, although I am participating in the event where they might get some Scripture wrong. That is the same as Jesus participating with these other folks, even as they got some things wrong. He made wine for heaven’s sake at Cana. Sure some might have had too much to drink, getting drunk, and thereby sinning. Was Jesus their enabler? Was He sinning by doing so. We know that answer but how does the legalist answer? What does the legalist say? As far as the, “How come you didn’t get the producers down on their knees to accept Christ bit”, really? I have been witnessing for hours these last few days. So what? That is my business and God’s. It is not yours. Using that as a club to beat another believer over the head, to help prove your point is an ad hominem attack and is shameful. You should apologize. Somehow I don’t believe that will be forthcoming. Well Pastor Jack will be reigning in my horns here so I will stop. I pray you will consider these points. Hello Doc. I will give the apology you say I should give but attack was not the intention. I will not speak to any other rhetoric you have thrown out. It would be a waste of time. But, keep in mind, they stoned Stephen for speaking the truth. So be it. End of conversation! Hi Danny, Have you seen the movie? I hope so otherwise you are not speaking from your opinion but by someone else’s. Just a reminder that my article very clearly says that before anyone sees this movie they ought to read several passages from the Bible first. I am sad that you missed that part. I am not able to tell people what they should or should not choose to do with the truth or untruth. I can only suggest they read it and pray that they do. Regarding your question: “Did you ask the director if he would allow you to pray with him and ask Jesus to become the complete Lord of his life?” My answer is no. If I had the opportunity to speak privately with the director (which I did not) I would have shared the simple truth of the Gospel with him and ask him if he believed the truth. I would have made sure that he had a real and true opportunity to accepted Jesus as his personal Savior. Asking him to allow Jesus to be Lord of his life is not something that I or any other believer should do. It is our job to take Jesus to the unsaved world and it is their choice to accept salvation or not. Salvation is what we share and then AFTER salvation when Holy Spirit is onboard (Eph 1:12-14, 4:30) they can choose to follow His leading to make Jesus not only their Savior but also their Lord. It has to happen in that order because otherwise 1 Cor 12:3 would be contradicted. No man can call Jesus Lord but by the Holy Ghost. With this I agree: “Wow! Nuff said!” Thank you for taking the time to post your comments here. Amen Pam. God is the true evangelist. Saving people by our sharing the gospel is it not our responsibility…it is their response to His ability because God gives the increase! Well said. Several areas I have experienced in my walk after my Savior. People sincere in their desire to grow and learn and obey the LORD because they love Him and want to walk in truth and want to learn how they might better do that. People who are so intent on loving others that they fear to bring anything to the table that might cause others to become angry and stop their walking after Christ. The pews are full and so are the coffers but the hearts are weak in the faith. People who are wanting to be right and demonstrate their rightness for the sake of not stumbling others but in the process end up harming others in their walk …. People who are not as interested in the truth as they are in turning other from it ….aka “tares’ among the wheat….which the enemy sows. I wonder how gleeful the enemy of the gospel is to observe that those who claim Christ have turned their energies upon one another rather than to read and do what Christ has point our. Discerning what is beneficial to our walk and living out our faith is indeed worthy and there are plenty of opportunities to take what God has revealed to us in His Word to determine if something is profitable to that end or not. Those who know not the scripture or know little of it due to their young faith OR due to their selective reading/hearing may learn more as they desire the sincere milk of the Word. Those who would rather defend their own opinions about the world and their own decision to take part in whatever is of the world will deal with the outcome be it profitable for their own walk and the Word or otherwise…. I pray we might think more carefully in how we deal with one another even as we endeavor to offer what the Word says about any issue. Phl 4:8 Finally, brethren, whatsoever things are true, whatsoever things are honest, whatsoever things are just, whatsoever things are pure, whatsoever things are lovely, whatsoever things are of good report; if there be any virtue, and if there be any praise, think on these things. Commenting upon the world and it’s view of God is not a bad thing ….becoming informed of what is going on is not a bad things….the end will be , what is the profit in terms of the Word influencing our own walk and what is the impact of being further informed about what is the content and aim of those things without. I think some of us have been hurt by over zealous ‘legalist’ and tend to get defensive whenever the idea of censure is ‘smelled’ on any comment….on the other hand we may also have been harmed by the caveiller presuming upon the grace of God and seen much harm to the body and maybe our own lives but such licentious attitudes which have led to sin. Perhaps this is a wise word for all of us to consider…and pray for our growing in the Lord according to how He has directed us through the scriptures. What the Lord works into the understanding of a person who is intent to follow Him is worthy also to consider and then like a Berean we are encouraged to study that issue in scripture and learn what the Lord would have us do. Unbelievers may be tweaked in their conscience to do so but the pubic disputing between those who claim the same Lord in the form of angry exchanges is just what the devil delights to see. Perhaps we all may get more from such situations an see how those who love the Lord would desire to walk rightly and be able to give an answer for their understanding in a civil and meaningful way that encourages more investigation among those who know not the Lord or may be weak in their knowledge and confidence as of this time. I have placed lengthy scripture here for the sake of those who may come to this site seeking answers and do not have access as of yet to the Bible….I pray it is useful to that end. Your Scripture verses are well received. I suppose if I stayed in the Catholic monastery, when and where I desired to become a priest, I would have avoided much of the conflict I come across in the world, where I find myself today. Jesus came to seek and to save the lost. He did not mince words with the “religious” folks of His day. I seem to recall Him calling them out as a brood of vipers. He accompanied His words with action as He drove out the money changers also. Paul confronted Peter when he hypocritically would not eat at table with the Gentiles. He did not go to a corner of the church and remain humble and quiet, trying to avoid conflict. I know from your history that you are a very non confrontational woman. These were legalists who were upsetting the Church with their “demands” for holiness, particularly circumcision, in order to be saved. There have always been debates within the church over the propriety of different aspects of the faith, from sprinkling vs immersion in Baptism, to belief in transubstantiation to representative symbolism, and Christians have discussed these issues through the centuries. I apologize if my abrupt manner upsets you. That is not my intent. I mean to upset the Judaizers, who would return us to being bound by the Law. The same folks who blasted Jesus for healing on the Sabbath. Have you ever wondered why Jesus chose the Sabbath to perform all of His Biblical miracles of healing? Have you ever asked a SDA why that was? I am not sure staying in the monastry would have caused you to avoid conflict. I am also not devoid of interest in confrontation but have tried to make an effort to view from scripture the beams in my own eye…perhaps making me more willing to consider the possibility that I have misheard or misunderstood what another might have had to say. Still I do share your view against true legalism as it is somehow one of those things that Christians seek to rid themselves while not falling into disregard for the way the wisdom of the Lord will lend itself to being persuaded that truth of scripture does not matter ‘as we go along to get along’ which is one of the fertile grounds for ecuminicalism. What is wrong with ecuminicalism? One part may be as we see more and more effort toward a one world government, one world religion and one world everything making the last days world ready for the last ONE world leader …..aka ANTI Christ. You are wise to consult His example as you have sited. Most of those who we encounter and claim His name have their first concern to hear and follow His Words and allow Him to open our understanding and further build upon the solid rock . The apostles, prophets and Jesus Christ the chief cornerstone. All else is what we are to learn how to deal with in one way or another through applying what He teaches us through His Word which records His will for us to avail ourselves of. I do not think you are particpating in whatever the world has to offer as sin but I do think where some of those who are coming in considering this movie is more about a form of appearing to endorse it as truth. The choice to see the movie is not what I think is a point of sin but as we may see something I do think it is worthy to consider what truths or what lies whatever media is being considered to be a worthwhile concern. So watch it in the theaters or at home or don’t watch …the bottom line is does it effect the heart of those who watch or does disputing to the point of anger and strife have an even more damaging effect upon the cause of Christ? As a musician who wrote and performed music and then as a believer did so with concern for having the content of the music be perhaps according the scripture so it might edify the hearers I do not wonder how some of the most ‘innocent’ of entertainments might have a deeper more impactful effect upon the hearer. But as I worked in nightclubs while between concert and other work of ministry I found it to be a ‘mission field ‘ from the intention of my own heart and convictions. Reaching out to people where they are is very truly what Jesus did and we may do . Encouraging people to think about the things they see and do in more and more judgment by GOD’S word and counsel is wise and useful. How many became followers of the Lord was not mine to know …some years later the news of someone coming to Christ and even being an active witness has been both encouraging and joyful but it was not by MY work at all . God calls and knows who are His and man has the freedom to hear and to follow after seeking the Lord. Our joy and calling is IN HIM . His ongoing work is HIS adding to the church such as are being saved. He finished the work of salvation and redemption . In us His Spirit continues to work IN those who are His I believe as we avail ourselves to taking heed to His Word. The jurisdiction of the Lord is in His Word working in those who also take the responsiblity for their own responses to His Word as it informs and reminds us of what and how to live . As I came to be a mother and then came to the idea of home education I found in my desire to teach my children what GOD wanted me to teach for their own growth in wisdom and my own need to learn how to do that …discerning and choosing the better of the choices according to what was profitable for all of the godly characteristics I found in the Word was a big deal . Keep on with your walk my brother…I find the longer I keep at this ..am confronted with some pretty discouraging offerings by some atheists , and some various sects that the Lord is still gracious unto us since we have been enduring through this age of ‘many roads’ to the Lord which confound those who are desiring to know Him and the counsel of His will unincumbered . The present entrance into many churches of New Age isms, Emergent ideas of ways to be ‘spiritual’ and various other gnostic points of view are only more evidence of our need to be informed of all things that the Lord would have us be knowledgable of in His Word and view so that we may give an answer to those who are in confusion. My first ‘student’ is the one I see in my mirror every day…. This issue is important since Humanism has completely caused confusion as to WHO are the ‘children of God’ ….in the secular world and other spiritual isms …all people are considered children of God ….yet Jesus made a distinction among people. The fallen state of man does not automatically include him in the family of God. This also brings us JURISDICTION. The jurisdiction of each person is that of their own soul. They may choose to believe in the gospel of Jesus Christ and be born into the family of GOD as children of GOD then they have the continued jurisdiction to learn and obey what the Holy Spirit which is given in all scripture which is God breathed and profitable for doctrine , reproof and correction which is instruction in righteousness. What is heard as ‘doctrine ‘ to one may function in their hearing as ‘reproof’ or ‘correction’ depending upon the need and condition of the believer. Those who marry take upon themselves another jurisdiction …that of the man is to love his wife as Christ loved the Church and gave himSELF for her…that of the woman is to respond with respect as her husband is now that person responsible to love , nurture, keep ]provide] and protect her as his own body. The leading of others also has a jurisdiction described in the Word based upon the evidence of the Word working in the life of a man which is seen more and more according to how he is governing [not controlling ] his own family. All of these various jurisdictions are built upon the one entering in of beng born again and then growing and allowing the Word to govern one’s decisions and actions. Much of the chaos in the society and church has arisen from not knowing or heeding these areas of distinction God has provided that we may live peacable and godly lives unto Him and for the testimony of Christ. Just a thought that came following my last post….for consideration. This is for Danny and Doc. I cry “pax“ as an interjection, “a call signaling an ending of hostilities“. Sadly the church is often divided on issues, and this gives the devil pleasure, to see people of God arguing over things that arent really important. Rather, let us consider the new commandment that Jesus gives “to love one another as I have loved you, by this shall all men know that you are My disciples“. Let it suffice what the Apostle Paul says, and let us be led by the Holy Spirit and our conscience whether to see this film or not. Amen? May God the Father, God the Son and God the Holy Spirit bless you both. I will wait until Pastor Jack censors me, if he feels I am being hostile. The problem, in my opinion, is that the majority of Christians, you and Kris being quintessential examples, are unable or unwilling to hear ideas that affect all people, in an open forum, which might make you feel uncomfortable….may I conjecture, un-Christian. At the first sign of disagreement you reach for the Holy Water to try to dampen the perceived “hostilities”. I think robust airing of these ideas is paramount to stretching the provincial thinking that has stereotyped Christians, in the eyes of the world, as unthinking, weak brained, iconoclasts, who are unwilling to take a stand and speak out and defend why and what they believe. What, literally, “in the world” are we so afraid of. Is our silence winning souls?? I would way more rather be impolite and defend Christ than by my silence, deny Him. Says you! Please defend your position that this is not important!! This is exactly my point. Christians attempt to marginalize the voice of other Christians by making these exact same statements. You say, it is not important!! I say it is of primary importance! I have made my defense of my position, previously. Where is your support for what you believe? I think it is important to discuss about whether Jesus participated with those who walked in sin, and to define “participation”. Lets have a discussion, without the silencing of those who want questions answered or at least discussed, instead of quoting Scripture about how we must be as harmless as doves. I may be accused of being impolite and I am, my wife tells me, but please stay at the table and do not walk away, thinking I am not Godly enough for you to participate in a discussion. Danny and Geno walked away, will you join them? Please don’t. Plus I will not be offended if you are impolite to me. I would rather be challenged for what I believe than be silenced by Christian police, who believe their rules for propriety overrule those who seek a wrestling with these ideas. Now, I guess I have been impolite again. I am confrontational and many Christians shrink from that. I am presently writing a book on “Simple Things…Stupid!”, for general readership. This includes, “The World as We See It”, speaking of how the world points to a Creator; “Why Big Waters Covered the World”; “Why Another Wooden Ark”, (speaking of the Ark of the Cross); and, “Why Me”, (speaking about the worldwide conflagration that is coming and why we need to get inside the ark of the Cross). IOW, “DON’T BE STUPID!! INSTEAD BE SAVED! !” is the final Chapter, but that theme runs throughout the Book. How can you be so stupid as to not see a designer in your eye, I ask(I am an eye doctor so I wax eloquent in that chapter). It is very in your face confrontational, and hopefully not for Christians. I want to reach the unsaved. I am so glad this Noah movie came out to peak public awareness. We need to speak boldly regarding the fact that there is a very short amount of time left before the doors of the Ark will be closed forever. I challenge the unbeliever to remain being stupid or take God’s life preserver(that chapter is actually on the fire retardant super sized suit before you die from having super-sized all of your fast food meals). It is obviously tongue-in-cheek…but not really, as the Christian knows. Christians are in the stands cheering for the team called of course “Stupid Away Team”(away, as the prodigal, from their home with the Father) battling the Home Team(the enemy of their souls whose home is this world). Lets have the discussion and let the moderators of this site decide what to print and who to silence. Doc. why “wait for Jack to censure me?“ And as far as “…as unable or unwilling to hear ideas…which makes you feel uncomfortable“ I heartily disagree. It is the manner in which these ideas are put. Similarly “at the first sign of disagreement…“. Again it is the manner in which they are put across. Maybe you would have made a good inquisitor to “persuade“ those who don`t believe what you do. We are all different, however, there are common truths in the Gospels that bind Christians together, Namely that Jesus IS the Son of God, He died for our sins. That He rose again from the dead. And that if we give our lives to Him we will receive eternal life. That we should love one another. Perhaps 1 Cor 13 vs`s 1 “…but have not love…I am only a noisy gong or a clanging cymbal“ Vs 4 “love endures long and is patient and kind…is not boastful or vainglorious, does not display itself haughtily. Vs 5 “It is not conceited [arrogant and inflated with pride] . It is not rude and does not act unbecomingly, does not insist on its own rights or its own way. Proverbs 15 vs 1 “ A soft answer turns away wrath , but grievous words stir up anger“. It is in the eye of the beholder David. I frequent atheist websites and my discussions are mainly with these souls which are very robust in their discussions regarding the world, the way they see it. I suppose it may look like an attack to you. It is not a personal attack so much as an attack on the ideas of those I disagree with. Are you able to see the difference? It is in an adversarial conversation, regarding everything from first causes to the moral argument to fine tuning to old vs young earth. I challenge people to defend their positions, as I did you. I don’t want to turn away wrath in many of my debates with atheists. The madder they get with me, the better. They get many more joining in with them when they are angry and it allows me to broaden the audience with more evidence for God in Creation. Why should we allow them to remain all comfortable in their folly? Would you rather have me tell them that God loves them and has a wonderful plan for their lives? Good luck with that. God does not have a wonderful plan for their lives. They are all going to hell…forever…for breaking the Laws they know to be common to all men’s consciences. You shall not lie, steal, look with lust upon another, hate, blaspheme the God who made you, covet, etc. Let the conversation drift to God’s dependence upon us and the discussion takes on a life of its own. (Aside:This self modulating dependence, by God, is seen in the co-creative act of a child’s conception and birth. God allows us to participate with Him in this act of creation. Sure God could make a bunch of new people wholly formed but He chooses to involve us in this creative act of birthing new humans, hence His dependence on our free will decision to pro-create. So, the penalty when they die and stand before the God who made them is death(hell), for all eternity. They can avoid this plight by turning from their sin and believing in the penalty that has been paid on their behalf, Jesus Christ, their only hope of escape from eternal damnation. They hate hearing this!! Why? Because the “Law of the lord is perfect, converting (convicting) the soul” (Ps19:7) …..parenthetical remark mine. These are intellectuals who are hardened and bold in their deceit. They need to hear the truth. If I am, as you say, their inquisitor, so be it. Where else will they hear it? Is this tough love, you bet. You unfortunately mistake my boldness for arrogance and my concern over their eternal destination for a personal attack. The church has been cowed by being told this so many times it has become a mantra: “Be soft, don’t offend, show them your kindness”, it actually makes me a little sick. Yes “to the meek, be meek”. These are not the meek. We have kept out of the sinner’s way so much that we just end up out of their way…literally….is that love? The 83 year old professor I have been diligently working with will not budge in his unbelief. Thank you for all who prayed for him. I have been showing him all the reasons why the case for God’s existence so outweigh the reasons for his non-existence. I then have showed him all the reasons to see Jesus as the perfect answer for God’s solution to our transgression of God’s anger at our disobedience to His Law. It has been cordial and yes David I put my rack away since I figured his grade four bladder cancer would not take many turns of my screws. I feel I was too easy on him. I think I will go back tomorrow and turn the screws some, and reinforce his destination(soon) without the Savior. (Aside: He mocks our belief in God as irrational. I showed Him that if I believe in God, then it is totally rational for me to believe that He should have given me the cognitive constructs to choose Him and therefore it would be an irrational violation of those cognitive faculties to deny Him. Therefore rational behavior has nothing to do with belief in God but upon the proper operation of cognition). He might end up seeing me as you think me. All I care is that he calls out to Jesus before his last breath. Maybe he will remember me telling him he will burn for all eternity without Christ. I really do not care what it will take. I refuse to “love” him through my meek, humble, and silent behavior. Yes, I will continue to pray as I hope those out there will also. Doc, I never water down, or compromise. Obviously we have different ways to witness. Better you keep your way, and I mine. As long as the Word is preached to the unsaved. Matthew 5 vs 9 Amplified Bible “Blessed [enjoying enviable happiness, spiritually prosperous- with life-joy and satisfaction in God`s favour and salvation, regardless of their outward conditions] are the makers and maintainers of peace, for they shall be called the sons of God“. As Kriss pointed out, God uses different ways to approach the unsaved according to their personality. When I heard the Gospel preached it was with the conviction of the Holy Spirit, the evangelist who led me to salvation was sensitive to the leading of the Holy Spirit, and nearly 39 years later I am still with the Lord, and learning every day. It wasn`t bombastic, he simply told me what God had laid on his heart, and it was exactly what I needed. Jesus Himself used many different ways to heal and deliver people, and to me His way is the best way. I pray for your ministry Doc. David,,,this is in reply to your “good cop , bad cop” remark….made me chuckle….Maybe I could be like “Abby’ on NCIS!…..heeehee….every ‘cop’ show has one colorful girl these days . I think one of the things I have noted with people who wake up as they realize how ‘soft’ on sin the preaching has been and has been detrimental if not disastrous for believers who do not investigate in the Word…the way these kinds of venues seem to lull people into a ‘comfortable’ place …where they don’t realize what they are missing out on in terms of learning and not being deceived. I am glad to meet you two …caring that people are cluelessly going to hell is a good thing….and offering the testimony of the Gospel of Jesus Christ is our privilege and joy….Lets “saddle up” and rejoice…and again I say REJOICE!!! N.W. USA…All the world is our ‘mission field”!Yeeeha! Yes…In Jesus Christ it is WIN WIN……pray for the continued adding to the Church for many are perishing and are without hope! Of course we’d like nothing better! Considering that many who I speak with are not believers there is a lot of reviling, evil speaking, slander, rejection and rebuke which has only caused me to go back and check out my understanding of the things brought up because I do fear to mislead or give any form of the Word to anyone in error. Indeed reproofs and corrections are most welcome for I have lived long enough to know the way my own flesh is prone to be deceived if I only evaluate experiences by my flesh or emotions …or even my own knowledge. Thank you for the reminder that we need to always be willing to hear what is brought to our attention that we might examine ourselves by the Word of GOD! May we continue to contend for the faith and to remain mindful of how our brethren in the faith are in the sight of our Shepherd whose desire and care is for the truth, the lost, and very truely His flock. The Bible gives us wisdom HOW to engage over all things with the Word …. When Jesus dealt with those who rejected the truth HE testified to the truth t by speaking it not from His flesh but by the Spirit which is truth. He sent out the twelve to speak what they were given to speak. When a person RECEIVES the Word of GOD with MEEKNESS it works in them….if they are hardened against the truth for all the ways the WORD tells us and is evidenced by various ways which are listed among other things foolish questions, genealogies and debate we are not to continue but to move on. Because we care about people’s souls we may because of our emotions and even pride insist that by our intellectual prowess and even knowledge of scripture we may open the heart …even though many who were very skilled in such means …Paul testifying to King Agrippa comes to mind….did not see an impact from his efforts there. It is difficult to sometimes allow GOD to take over the job of convincing those we have given our best effort to share the truth of the gospel with . Many try to implement various ‘techniques’ and ‘approaches’ to ‘getting someone saved ….but sometimes we need to stop all of our effort and consider who will get the glory if we ‘win’ the debate or even convince a person to give in to OUR arguments …no matter how well meant or presented. Some people may seem to have more ‘success’ in turning others to Christ but only GOD knows the depth and sincerity of those souls. Having done all we are told to STAND …to be clothed with the armour of GOD and to continue in prayer and supplication for the saints…and all men. We are told also not to give up or give in but not to strive in doubtful disputations that gender strife and first and foremost to be especially GOOD to the those of the household of faith. I admit it is exciting and a learning experience to watch James White of Alpa and Omega debate the various Islamic leaders and scholars. He is very knowledgable of the Muslem religion , speaks the language and has read ALL of their books in their language as well as having a great handle on the Bible. I also learn a lot in watching debates between Creationists and Athests. However among the body debate and railing are not what I see as instructions for us among ourselves . We are instructed to contend for the faith and to instruct one another with tenderhearted , and expectation of civility. So many aspects of our walk with one another are spoken of as how even unbelievers might observe the love and ways we follow the Lord. We have spoken of a few here …The prophets of the OT often were frustrated…and even God is recorded as hating …but what does HE hate? We all have people in our lives who we would LOVE to see turn to the Lord and perhaps have spent many MANY hours in effort to demonstrate and even answer all of their objections to coming to the Lord….the WORD tells us that those who love the world, the flesh and the devil will hate those who are Jesus Christ’s ! Those who are realizing their poverty of spirit will be the ‘the poor in SPIRIT will find Him…All of the Sermon on the mount teaches the condition of the heart that is hungry and receptive to truth that saves. In watching people like Ray Comfort deal with the hearts of people to confront them with the law to bring them to think and realize their need he also does deal with some who want to debate and argue …and who knows when or if they will ever receive the Word …it is interesting to watch and even engage this way . Yes speaking the truth is also our overflow of our walk …but after we have done so I believe the ‘work of GOD is that you believe ‘ indicates that it is HIS work …since His word never returns void…even after you have done ALL you know to do …then we are to STAND therefore with your loins girt about with truth …feet shod with the preparation of the gospel …put on the breast plate of righteousness….which is HIS righteousness….the helmet of salvation …the shield of faith wherewith we are to quench all the firery darts of the wicked…and take up the sword of the spirit which is the word of GOD . The power of GOD is the ‘worker’ as we speak it …as we are given it …as it comes up from where we have sown it into our hearts …for out of the abundance of the heart the mouth speaks and not the other way around. The word is effectual in that even if nobody believes it those who are willing to speak it will be edified because the word never returns void and being the speaker of the Word one who speaks also hears what he shares. Zec 4:6	Then he answered and spake unto me, saying, This is the word of the LORD unto Zerubbabel, saying, Not by might, nor by power, but by my spirit, saith the LORD of hosts. I know the frustration and the passion of trying to find just the right word to cause someone to turn to the Lord . Perhaps after a time the word you have sown out of the inspiration from the Lord which is His WORD coming up from where you have prepared your heart and kept it will bring forth the fruit ….that you and the Lord desire to see in that person’s life. Your laboring for the sake of that soul is not unnoticed by the Lord and do we think HE is not able to move upon the heart of that person ? Your working to show a person the need for salvation is not a guarentee they will receive it or demonstrate faith in your presence…perhaps I am mistaken but sometimes it takes a while…I have heard of people I testified and shared with many years ago …and found out they indeed came to Christ …some of the most UNLIKELY we would think by our knowledge and experience with them…GOD knew and I don’t …. AND some of them were dramatically changed…now teaching fellowships in hospitals….working …not even from any man directed ministry ..The Lord is ABLE to save to the uttermost …we do not need to be discouraged by what we see ….but to do what we have in front of us and trust that we have done our best to obey the Lord in all things. It is not fear of confrontation or contending that one may speak to one boldly and another with a more soft approach ..the Spirit of the Lord IN the believer works to inspire as we are willing to submit to speaking …and it is really amazing to see how the Lord works …sometimes in spite of us. People still have a free will to choose to hear …to consider…and that is what God’s Word tells us ..Selah…’consider these words’ …. Doc…”good cop bad cop ” somehow you did not think of David as a ” bad cop” ! Hahahaha,,….good one ! You two could be on a stage….one is leaving in ten minutes…! badumbum! Movie guide article….Noah Inspires People to read the Bible stats Reveal…..! Doc, still chuckling about your comment “good cop bad cop“. The REALLY good thing about this post is the number of responses that people make. Personally I am glad that there are so many responses, see the film, then pass judgement. I just saw this last night and thought it worth offering here …It is GOD who makes the light shine out of the darkness…and glorifies Himself despite opposition ….Indeed…this video brings salvation to light as it discusses the movie Noah!~yeay! Check out this teaching exposing Gnostism and it’s ‘sermons’ via The DaVinci Code …and media ‘preaching’ the upside down ‘gospel’ of satan and those who “know not the ‘spirit they are OF ” as they follow these lies. The teaching on this site by Joseph Schimmel exposes the truths people need to seek out in scripture regarding this deadly Ancient “new age’ doctrines embedded in our entertainment. I just found this and listened and have to agree , having had some time in the past before coming to Christ the things that are ‘hiding in plain sight’ and being accepted by those who know not the truth of Jesus Christ and the Word of GOD. The teaching I am referring to on his site is “The DaVinci Code the D Con for Humans’ ….far down on the list of audios on this link.. He has also that site where the various videos are sampled that address a lot of music and media and exposes content that may not be apparent to those who have not studied scripture or how the Word of GOD is useful to our need to be informed and walking in a living relationship with Jesus Christ the Savior . Enjoy is you are interested in searching out the way God’s Word will expose whatever you read, or hear as a Berean …search out in scripture if these things be so. This is the pastor who also has several video documentaries out examining the topics of Rock and Roll….and Hollywood agenda…..worth taking a listen to …his videos are also on Youtube to sample ,…”They Sold Their Souls for Rock and Roll”, “Hollywood Unmasked” , “Rock and Roll Sorcerers of the New Age Movement” , “Hollywood’s War on the Church”, “The Submerging Church”, “The Kinsey Syndrome”…and more. These materials have much to offer in terms of clips of individuals whose music and lifestyles have influenced much of our culture so are worth taking a look to consider how this sits with the biblical counsel from scripture. If this link is permitted by the host of this website I thought it brought some good food for thought about these issue….. I see Josh(creator of this site) is promoting Heaven is for Real, the new movie coming out about a young boy’s “after life” true experience. Lets start the ball rolling with all of the Hollywood controversy. What is the difference between this and the Noah movie? Why should we support the “light at the end of the tunnel” phenomenon? Doesn’t this just make everyone content with the fact that their light awaits? All they have to do is lead a good life and they will get theirs too? We know that the True Light(Christ) awaits only those who place their trust in Him. The light of eternal fire awaits all others. Should we be supporting a movie that promotes the idea that the light awaits all? I have not seen the movie, but I believe there is no mention of Christ nor belief in Him as our guarantee of Heaven from what I have been told about the movie. Your thoughts? You bring up a great point. Hollywood is, like any business looking for fast cash and most people who do not know the Lord are curious about what happens ‘after’ . The various offerings of the god of this world are plentiful aren’t they. The spirit realm has what are known as ‘familiar spirits’ . These are those spirits who were complicite with the Devil from what I have been able to learn about them in the scriptures. They ‘pose’ as anyone in history and do so very well since they have been around since the beginning. They are ‘familiar’ with anyone that has lived. The vulnerable person who has not come to understand how they function and have access to the minds of those who know not the truth found in the Word of GOD will believe what they see, hear, experience without the filter of the Word to help them understand what has happened. I did not see this movie . I do not know the details of the child concerned . I do not doubt that he has had some encounter with a spirit which was able to put into his mind thoughts that would seem real to him. The various ‘authentication’ information was known to the spirit realm of the god of this world since he and they are very able to know whatever has been. The only person who has been raised from the dead and did not die again but has been seen, handled and witnessed by many witnesses was Jesus Christ who is seated presently at the right hand of the Father as you know. People are prone to believe their senses and the spirits who seek to manipulate the unwary or unlearned in order to have them on a rabbit trail of spiritism and the occult thrive on this particular. Jesus said that we are to live by faith and by the knowledge of His Word and to gain understanding by asking according to what He told us he is willing and able to do as revealed in His Word . Facts about people this child could not have known are easily known by the demon realm. We are not promised a ‘light’ in the sense of this kind of belief but Jesus IS the Light of the World and He has given His Word so that we may KNOW those things which HE wants us to learn. Until someone has searched the scriptures and walked after the Lord it seems like one of those ‘short cuts ‘ to know God by way of ‘another way’ . I enjoy movies and one’s that get us to thinking about things whereby we may take all of that with the ‘grain of salt’ provided for us to study and search out in scripture. Hollywood likes to make money and people like to see what they hope to be true but when it comes to our eternity lets hope they will continue to search out the things of GOD in the Word that He has provided for us. Next post: Can Our Loved Ones See Us From Heaven?